Ben T. Elliott, a Concord resident, has spent the past 20 years honing his culinary skills in some of the country’s most celebrated kitchens. From La Folie and the Fifth Floor under Chef Laurant Gras in San Francisco, to Lockeober and No9 Park in Boston, Ben has held a variety of positions in a quest to master various culinary specialties. 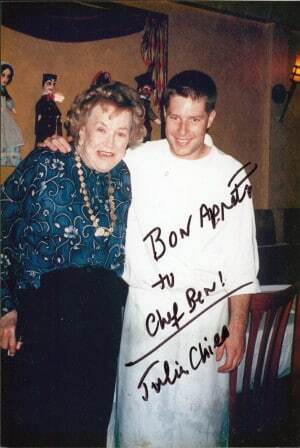 During his 7 year career with James Beard Award-winning chef Barbara Lynch, Ben was Chef de Cusine at No.9 Park, then moved to the South End to open Lynch’s demonstration kitchen Stir and recipe tested for her cookbook of the same name, and most recently launched Lynch’s catering company, 9 at Home, as Chef de Cuisine before leaving to start his own business in 2010. Currently, Ben caters cocktail parties, private dinners, and cooking classes through his newest endeavor Saltbox Farm; a small catering company that he has recently started on his grandparent’s 10-acre property in Concord, Massachusetts. He has also recently opened The Little House, a farm based cooking school at Saltbox Farm. Chef Ben’s approach to cooking features dishes that are driven by the seasons, rooted in French technique, and inspired by New England traditions. Whenever possible, Ben utilizes ingredients from local farmers and artisans. When Ben isn’t cooking, he is pursuing his other passion, farming. He is restoring Saltbox Farm, which his grandparents built in the 1940s. There he grows a variety of vegetables and flowers, which he sells through his CSA, at his farm stand and at local farmer’s markets each summer and fall. On the farm, Ben keeps sheep, chickens for eggs,bees for honey, and has recently planted a small orchard that includes apples, peaches, pears and cherries. Ben lives on Saltbox Farm with his wife Julia, his son Sam, and his daughter Maggie.